Order your Native Instruments Komplete 12 Ultimate Collectors Edition Upgrade From K 8 to 11 from AMS and enjoy 0% Interest Payment Plans, Free Shipping, Free Extended Warranty & 45 Day Money Back Guarantee. Upgrading to Komplete 12 Ultimate Collector’s Edition gives users Native Instrument’s most expansive software suite to date! This upgrade provides a remarkable 150+ premium instruments and effects, with over 90,000 sounds, plus the full SYMPHONY SERIES – COLLECTION, and more than 45 Expansions! Must own the regular Komplete 8-12 to use this upgrade. 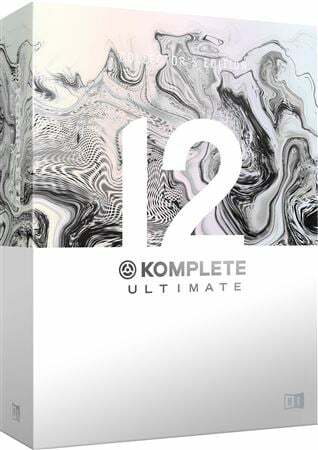 KOMPLETE 12 ULTIMATE Collector’s Edition includes more than 45 Expansions – genre-specific sound packs loaded with synth presets, drum kits, one-shots, samples, and loops. Created by top artists and sound designers, Expansions can be used in any DAW and work with a range of Native Instruments products, including MASSIVE, BATTERY 4, and MONARK. The Compendium of all VST's. Not to sound like a commercial, but if you are serious about music production whether it is jingle writing, film score...or beat making for the local artist...This is a must have in your studio. This upgrade(in tandem with the standard version) really is a "komplete" collection. Drums, bass, guitar, synthesizers, piano, orchestral, cinematic, mixing/mastering FX. It has basically something for everything and everybody. If you were to buy just one software bundle for instruments/FX, this is the one you should buy. All the included sounds and instruments are pro quality. Some of these plugins are resource hogs though, so if you plan to do something like heavy orchestration(especially at higher sample rates), you better have at least a 6 core CPU with a high clock speed(think: i7 8700K).